It is becoming increasingly clear that it is the total absence of financial management, not just insufficient installed generating capacity, that is the crux of the worsening energy problems in Pakistan. Riots have broken out as the Punjab, Pakistan's largest province, finds itself in the midst of the worst ever electricity crisis in the nation's history. The power shortfall has reached almost 9000 megawatts across the country, over half of the total demand of about 17000 MW. Many public and private power producers have shut down their power plants due to the suspension of fuel supply by Pakistan State Oil, the state-owned oil company, according to a report in the Express Tribune. The oil company is demanding payment of Rs. 155 billion in outstanding dues from the power producers before resuming fuel supply. 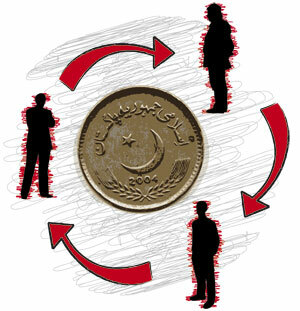 The key players in this "circular debt" trap are the federal and provincial governments as the biggest deadbeats, the power distributors like LESCO and KESC, the power producers like Pepco and Hubco, and the fuel suppliers like government-owned Pakistan State Oil (PSO) and partially state-owned Pak-Arab Refinery Ltd (PARCO). This debt circle begins with the government as the biggest debtor and ends with a government-owned entity as the biggest creditor. So the obvious question is: If the government is both the biggest debtor and the biggest creditor, then why is it that the government leaders can not solve the problem? Is it the lack of will? or the lack of competence? Increased load shedding in Pakistan has cost 400,000 jobs in recent years, according to the World Bank. Although the World Bank report does not address it directly, the anecdotal evidence suggests that almost all of Pakistan's 13 million jobs in the decade of 2000-2010 were created from 2000-2007 when the economy showed robust gdp growth. Clearly, the circular debt problem has assumed alarming proportions, threatening Pakistan's future. The IMF and the US officials in their recent meetings with Pakistan government have described the circular debt as a significant threat to the country’s economy. Unless the government urgently takes serious steps to manage and resolve this worsening electricity crisis by putting a fully empowered competent team in charge, it will only get worse and make life impossible for both businesses and consumers, and cause a total collapse of an already struggling national economy. ISLAMABAD: Amid countrywide protests against crippling power outages, Prime Minister Yusuf Raza Gillani on Monday ordered the release of Rs9 billion to Pakistan State Oil to ensure fuel supply to make Hubco, Kapco and other public sector power generation companies operational, a senior official, who attended the meeting on the power crisis held here with the prime minister in the chair, told The News. Over the last three and half years, the government has injected over Rs1,000 billion in the power sector to turn it around, but circular debt has swelled to Rs300 billion. When contacted, finance secretary Dr Waqar Masud confirmed that he has released Rs9 billion immediately to help normalise fuel supply to Hubco (Hub Power Company) and Kapco (Kot Addu Power Company). Kapco was earlier generating just 200MW and Hubco 500MW but with the increase in fuel supply both powerhouses will start generating 2000-3000 MW of electricity. Masud said that the ministerial committee on energy would finalise its recommendations today (Tuesday) to resolve the energy crisis on a short, medium and long-term bases. The recommendations will soon be placed for approval before the special cabinet meeting to be attended by the chief ministers. He said Monday’s meeting also reviewed the energy conservation plan, which will also be placed before the special cabinet meeting for approval. The plan, which includes two weekly holidays and other conservation measures, requires the approval of the provincial governments for implementation. An official at the ministry of water and power disclosed to The News that the prime minister has ordered Irsa to release more water to increase hydrogenation. The official said this decision is secretive keeping in view its sensitivity. The IPPs, which have the capacity to generate 8000MW, are producing 5000MW because of the government’s inability to pay them their dues. Importantly, the government is paying $9 million a month as capacity charges to the Karkey rental ship, which produces a mere 30MW electricity. In the last three years the government has increased the power tariff by 125 percent, but failed to improve its efficiency as line losses have swelled to 28 percent, officially shown at 23 percent. Likewise, Discos have failed to recover Rs89 billion dues from running defaulters whose electricity connections are still intact. Concerns over blackouts, inflation and unemployment are a far more pressing worry for many in the country of 180m people than the risk of the militant bombings or sectarian attacks that periodically rock Pakistan’s cities. In the industrial hub of Gujranwala in the eastern Punjab province, hundreds of protesters defied a shower of tear gas canisters fired by police to hurl stones and block a railway line, witnesses said. Mobs burnt six electricity company offices in the city on Monday. “The policemen are firing (tear gas) shells but the demonstrators are simply coming back with more rocks,” said Muhammad Tufail, a television reporter covering the protests. Similar clashes broke out in Faisalabad, Pakistan’s textile centre, where hundreds of workers laid off due to power cuts at their factories hurled stones at police. The cities of Peshawar, Quetta and Karachi have also witnessed protests this week after an unusually severe period of outages. Adding to the misery, Pakistan is battling an outbreak of dengue virus, which has claimed more than 150 lives in Punjab, according to media reports. Pakistan’s government, also facing a stubborn Taliban insurgency, had sought to rally its opponents into a united front last week to face allegations from Washington that the country’s military is backing Afghan insurgents. But Nawaz Sharif, Pakistan’s most prominent opposition leader and a former prime minister, has seized on the power crisis to lambast the government and threaten more protests. “We will be on the streets of Pakistan with our people if the government continues to fail in dealing with this situation,” said a senior leader from Mr Sharif’s PML-N party. Several ministers and other officials from the PML-Q, one of the parties in Mr Zardari’s coalition, submitted their resignations from cabinet posts on Tuesday, though the party has not formally left the government. “This is a time when we feel we have to show solidarity with our people who are protesting over the electricity shortages,” said Mushahid Hussain, a senior PML-Q leader. The power sector is hobbled by the government’s chronic failure to pay bills owed to companies that supply oil to power plants. Power prices charged to consumers have failed to generate sufficient revenue to sustain state-owned electricity companies. The government says it is releasing emergency funds to settle its bills, though an official warned that it could take several more days to curb the current spike in blackouts. Analysts say Pakistan's chronic electricity shortages are largely the result of the government not charging consumers enough and of customers, including the government, not paying their bills. There are also problems with outdated transmission systems and bureaucratic infighting that has stalled power generation projects. The U.S. is working with the Pakistani government to increase the power supply by constructing and rehabilitating six power plants, according to the U.S. Embassy. This extra energy will eradicate 20 percent of Pakistan's existing energy shortage, it said. But many analysts say a lasting solution to the country's power crisis must involve politically painful increases in electricity prices and forcing customers to pay their bills. The country's main opposition leader, former Prime Minister Nawaz Sharif, lashed out at the government over the electricity shortages. "The country is facing a severe power crisis, but the government is sleeping and doing nothing for the last 15 months over this issue," Sharif told reporters in Bahawalpur, another city in Punjab. Pakistani Prime Minister Yousuf Raza Gilani sought to deflect blame away from his government in an address to parliament on Monday, pointing his finger at the United States. He said that the U.S. should help Pakistan solve its energy crisis if it wanted better ties. Pakistan and the U.S. are nominally close allies in the war against Islamist extremists, and Islamabad has received billions of dollars in military and civilian aid over the past decade, including money to help the country's energy sector. But the two countries have often clashed, and Pakistani officials regularly criticize the U.S. to divert attention away from their own government's performance. Dubbed the circular debt issue, power companies have racked up billions in unpaid dues to petroleum companies, which supply them oil to run their powerhouses. On Sunday, Pakistan State Oil (PSO), tired of waiting for the dues long promised to them, decided to stop the petroleum supply to the power companies, leading to an increase in the already inhumane cuts. While the Government of Pakistan (GoP) has now released some funds to appease PSO, this is not a long-term solution. The Federal Minister for Water and Power Naveed Qamar responded to the most recent protests by saying that there were no quick fixes, and then turned around and announced that the situation would improve in 24-36 hours. Last week in Washington DC, the Finance Minister of Pakistan Hafeez Sheikh solemnly announced that the government understood the severity of the circular debt issue, and would resolve it in the weeks to come. But with a growing fiscal deficit, and a refusal of the Asian Development Bank to fund programs in Pakistan after the GoP decided to end their International Monetary Fund (IMF) loan program, how Pakistan plans to resolve the circular debt issue is anyone's guess. One solution, according to Prime Minister Yousaf Raza Gilani, was that the United States "should help Pakistan solve its energy crisis if it wanted better ties." The United States has previously said that it is investing in dams in Pakistan to help add to the power grid, and has helped in the reconstruction of existing dams in the country. However, Pakistan needs to stop looking towards the West for a solution (or a scapegoat), and perhaps redirect its attention to how to fix its problems internally first -- perhaps by collecting payment of unpaid bills, or cracking down against those stealing electricity. First, though, it has to deal with the political ramifications of these protests. The PML-N has played its cards right; by blaming the political center of which it is no longer part, it has easily scored political points while the PPP becomes the fall guy -- and to an extent, perhaps deservedly so. Pakistan's government, in turn, can only do so much. Strapped for cash, it barely has the funds to invest in power generation, and in cases where it has, such investments have barely led to a meaningful increase in the electricity grid. Additionally, in the face of all of these problems, if Pakistan raises power tariffs on those that have been suffering for the last many years, the law and order situation could become even more perilous. ALTHOUGH Pakistan makes international news for terrorist attacks, anti-American demonstrations and its alleged support for insurgents in Afghanistan, it is the basic inability to switch on a light that is pushing this volatile country closer to the edge. Popular anger over Pakistan’s crippling electricity shortage boiled over on to the streets this week, with riots that paralysed whole cities, unleashing running battles with the police and causing widespread damage to government offices. For ordinary people, the frustrations are endless. Refrigerators become useless. Water runs out because it relies on electrical pumps. Children do their homework by candlelight. Insufficient capacity is not even the biggest problem. That is a $6 billion chain of debt, ultimately owed by the state, that is debilitating the entire energy sector. Power plants are owed money by the national grid and the grid in turn cannot get consumers (including the Pakistani government) to pay for the electricity they use. This week, the financial crunch meant that oil supply to the two biggest private power plants was halted, because the state-owned oil company had no cash to procure fuel. The central government also continues to subsidise the cost of electricity to the tune of billions of dollars a year. That money, say the government’s critics, could be better used to pay its own bills and thereby free up unused capacity in power plants that are mothballed because of non-payment and disrepair. Cutting subsidies to people’s electricity bills, however, could lead to even more unrest. Critics argue that the government’s hand-to-mouth policymaking is self-defeating, and illustrates its general lack of planning. There are also plans for a gas pipeline from Iran, though the Americans have warned that the scheme could fall foul of their sanctions against Iran. Alternatives include access to Pakistan’s abundant untapped coal reserves, or importing gas and electricity from central Asia, across Afghanistan, a daunting proposition. However, it is the short term that is the real problem. Unless the Pakistani government can solve its cycle of debt and disorganisation, ordinary Pakistanis will continue to vent their fury. ISLAMABAD: With the addition of over Rs1 billion per day to circular debt, the cash flow deficit faced by the power sector has surged to Rs418 billion, betraying the devastatingly poor management of the power sector, a senior official at the Finance Ministry told The News. Currently, the power sector faces Rs302 billion circular debt, which continues to soar in the wake of mismanagement and inefficiency. The system loses Rs40 billion every year just due to excessive line distribution losses that have surged by 4 percent in recent months, from 21 to 25 percent. Another Rs6-7 billion islost every month because of slow recovery of bills while Rs24 billion goes to IPPs as late payment surcharge. Previously, line losses stood at 16.5 percent and transmission losses at 3.50 percent (total losses 20 percent) but have now increased to 21 and 4 per cent respectively, pushing a total 25 percent. It is pertinent to mention that one percent loss translates into Rs7.50 billion. In anther setback, the government continues to pay Rs9.6 billion as GST for electricity bills that it fails to recover. Similarly the government loses Rs2 billion per month in the wake of fuel adjustment loss due to 20 percent losses that have now increased to 25 percent. And because of decreased supply of gas to powerhouses, the government has to sustain the additional burden of Rs6 billion per month. The official said the Finance Ministry has asked the Ministry of Water and Power to improve its revenues outlook by improving recovery and paying arrears to IPPs and PSO. IPPs’ arrears currently stand at Rs208 billion, while those of PSO are Rs165 billion. However, the receivables of Pakistan Electric Power Company (Pepco) stand at Rs307 billion. The finance ministry has already told IPPs it will now pay Rs45 billion to them next month. This amount was to be paid before October 15, 2011 but Pepco failed to meet the deadline because of acute financial constraints. Meanwhile, the government has decided, the official said, to re-introduce uniform electric power tariff across the country, while the subsidy, which power consumers enjoyed, will go to the government. Currently 20 million consumers receive electricity bills under differential power tariff regime and the subsidy, which the government pays directly to the distribution companies, is mostly misused. “The government has decided no to raise the power tariff by 4 percent as suggested by the Ministry of Water and Power in the summary sent to PM Secretariat until and unless the power tariff rationalisation plan is implemented after its approval by the federal cabinet,” the finance ministry insider said. SLAMABAD: The details of outstanding power dues against government departments were presented before the National Assembly on Monday, Geo News reported. The figures presented by the Water and Power Ministry revealed that not just one but many departments were yet to clear their dues that run into the millions. According to details, payable dues against Senate Secretariat stood at Rs49.5 million; amount payable against federal ministers and their residences at Rs8.552 million; Parliament Lodges Rs12.1 million; Pak Secretariat Rs9.423 million; Supreme Court hearing cases of power projects scams at Rs3.47 million; Election Commission of Pakistan Rs2.997 million; federal police Rs19.1 million; Intelligence Bureau Rs2.726 million; ISI Rs8.224 million; FIA Rs4.3 and; the payables against Interior Ministry were Rs1.57 million. Reviving the economy will require addressing both near and medium-to-long term economic challenges. The solution to these challenges boils down to restoring macroeconomic stability on the one hand and promoting economic growth through growth critical reforms on the other. Let me share my thoughts on these economic challenges. For addressing near term economic challenges, the commitment to fiscal discipline is a pre-requisite. A sound fiscal position is essential to achieving macroeconomic stability, which is increasingly recognised as a critical ingredient for promoting strong and sustained economic growth and lasting poverty reduction. An adequate level of revenue generation is sine qua non for the public policy to fulfil growing expenditure requirements. The thrust of revenue mobilisation must include reducing tax rates, broadening the tax base, shifting the incidence of taxes from imports and investments to consumption and incomes, and providing a congenial environment to increase tax compliance. Every sector of the economy must be brought under the tax net. An equitable taxation system demands that income originating from any sector, if it crosses the threshold level, must be taxed. Potential areas which can be brought under the direct tax net include agricultural income, incomes of doctors, lawyers, beauty parlours, chartered accountants, wholesalers and retailers and transporters to name a few. Improving withholding tax regime would increase the government’s tax revenue immensely. Taxes are being collected by withholding tax agents but are not being deposited in the government’s treasury. I am glad that the FBR has taken note of this and is making efforts to address this issue. On the expenditure side, the government will have to take a bold decision as to the future of the rotten PSEs. In particular, how long can the government bail out these bleeding institutions from taxpayer money? The time has come to offload some of them even at a rupee each and appoint the best team available to manage the others. The government can save at least over Rs300 billion which can be spent on millions of defenceless poor and improving the country’s physical and human infrastructure. Inept handling of the power sector has resulted in the accumulation of unsustainable circular debt. By raising the power tariff alone, the government has caused circular debt to balloon. Raising the power tariff is tantamount to raising tax rates. It is common knowledge that if we keep on increasing tax rates people will avoid paying taxes. Similarly if we keep on raising power tariffs it will encourage people to use unfair means to avoid paying electricity bills. As long as there are line losses and power theft, the issue of circular debt will always be there. The government will have to reduce fiscal deficit from 6.5 percent of GDP last year (2010-11) to three percent by 2013-14. This can be achieved, provided there is commitment to fiscal discipline. Reduction in fiscal deficit will reduce the government’s borrowing requirements which in turn will help the SBP to reduce interest rate thereby freeing more credit for the private sector. This would also help the government to lessen its borrowing from the SBP and to moderate inflation. KARACHI, Dec. 3 (APP)- Finance Minister Dr Abdul Hafeez Shaikh said Saturday that the largest burden on the national economy is payment of Rs 1 trillion for the subsidy and losses of state-run power entities in the last four years.“This is a huge money”, he said while speaking at Karachi Press Club (KPC) on national economy. This means that the government is providing electricity to the consumers at a lower price than its cost, he added.The minister said that inefficiency and corporate mis-governance are other reasons for incurring colossal losses.He underlined the need for enhancing the role of private sector in state-run power sector organisations by encouraging public-private partnership to improve their performance and reduce losses. He said the government has to improve corporate governance, devise an ideal fuel mix, improve tariff structure and speed up future power projects to resolve energy crisis in the country. He said the tax collection has improved in the country due to government efforts to tax rich people. This will ensure self reliance. In the previous five months of current fiscal year, the revenue collection was higher by 28 percent to record Rs 640 billion compared to same period last year. This is more than the target, he noted. Dr Hafeez said that the current revenue collection target is Rs 1,952 billion which is higher by 25 percent over last year’s Rs 1,558 billion, up by 17 percent over 2009-10. He pointed out that the government has paid Rs 50 billion under Benazir Income Support Programme to poor under a cash transfer scheme. This is targeted subsidy programme to ensure that the poorest segment of the society should not be left behind, he added. He said that the government was trying to focus on the economy for the last five months to ensure economic stability in the country Referring to the flood 2010, the minister said that this catastrophe inflicted a colossal loss of $ 10 billion on the economy and eaten up 2 percent of the GDP. He said that Pakistan was threats to its security and the government will cut its own budget as well as of other sectors to ensure national security. Responding to a question about the possible stoppage of US financial support to Pakistan under present circumstances and the preparation of the government, he said that there was no big change in US policies relating to financial support to Pakistan. Pakistan will continue to get $ 500 million every year from USA, he noted. Finance Minister said that the largest fund providers to Pakistan are IMF, World Bank, Asian Development Bank and Islamic Development Bank and not USA. Moreover, we are presently focussing on “trade” and not on “aid” and therefore, are exploring markets in the coming years, he added. Recalling the political achievements of the present government, he said that an additional Rs 800 billion are being provided to the provinces under NFC award. “Now the provinces are getting 60 percent of the total national resources while the federation is getting only 40 percent from the national kitty. Prior to current NFC Award, federation was getting 54 percent of the national resources while provinces were getting 46 percent, he added. The Sui Northern Gas Pipelines Limited and Sui Southern Gas Company Limited are causing a cumulative annual loss of about Rs300 billion to national economy, almost six times the losses caused by power sector, because gas shortage leads to civil unrest and affect businesses, transport and households. The colossal loss has so far remained off the public eye because the gas shortage affects the public life only for three winter months and gas companies are paid at least 17 per cent guaranteed return on assets even if these continue to make losses. If these losses are controlled, about 700 million cubic feet of gas a day could be added to the overall supply, reducing the current shortfall by almost half. A senior government official in the planning commission told Dawn that the transmission and distribution losses â€“ described in the official jargon as unaccounted for gas â€“ of the two utilities that went up to 13 per cent were resulting in wasteful consumption of 350 million cubic feet per day (mmcfd). Given the fact that furnace oil is used as replacement fuel for power generation and industrial use, every million British Thermal Unit (mmbtu) costs the economy an additional burden of $20 per mmbtu, according to planning commission`s member energy Shahid Sattar. As such, the daily additional cost on import of furnace oil comes to about $7000, translating into an annual additional burden of $2.55 billion, he said. Likewise, domestic geysers are described as gas guzzlers whose efficiency could be increased by 20 per cent by putting in a small conical baffle costing Rs500 per piece in every geyser and the efficiency could be further improved by up to 45 per cent by installing instant geysers. These two measures alone could provide another saving of 250 mmcfd, reducing import bill by $450 million or Rs40 billion in three winter months. In comparison, the transmission and distribution losses of Wapda`s power companies currently stand at about 22 per cent which translates into an annual loss of about Rs60 billion. The official said the power losses at about 10-12 per cent were globally acceptable compared with 2-3 per cent losses in the gas distribution system. SNGPL Managing Director Arif Hamid says his company`s system loss stood at 11.7 per cent in October 2011 which was scaled down to 11.4 per cent in November. He is of the view that six per cent gas losses are globally acceptable. Ogra, in consultation with gas companies, had set a target of reducing system losses to 4.5 per cent by financial year 2010-11 when actual losses stood at about seven per cent and have since been increasing. The planning commission official said that Ogra had successfully brought down gas distribution losses to 4.5 per cent through mandatory one per cent loss reduction every year until 2008 but the previous Ogra chairman appointed on political grounds, and then sacked on orders of the Islamabad High Court and then the Supreme Court of Pakistan, raised these benchmarks to about 11 per cent. This additional cost estimated at over Rs70 billion over the past four years has not only created an additional demand of about 500 mmcfd but has also translated into gas tariff as expenditure incurred by the companies because the two utilities are guaranteed 17 per cent and 17.5 per cent return on assets under international covenants with the World Bank. The economic value multiplies manifold in view of the fact the supply is already short of demand by about 50 per cent in winter months. Giving an example, the official said a private domestic fertiliser plant was generating an annual revenue of about Rs15 billion by consuming only 35 mmcfd of gas. Its ultimate contribution to agriculture, employment generation and the national economy was manifold and not included in these estimates, the official said. India — India has long struggled to provide enough electricity to light its homes and power its industry around the clock. In recent years, the government and private sector sought to change that by building scores of new power plants. But that campaign is now running into difficulties because the country cannot get enough fuel — principally coal — to run the plants. Clumsy policies, poor management and environmental concerns have hampered the country’s efforts to dig up fuel fast enough to keep up with its growing need for power. A complex system of subsidies and price controls has limited investment, particularly in resources like coal and natural gas. It has also created anomalies, like retail electricity prices that are lower than the cost of producing power, which lead to big losses at state-owned utilities. An unsettled debate about how much of its forests India should turn over to mining has also limited coal production. The power sector’s problems have substantially contributed to a second year of slowing economic growth in India, to an estimated 7 percent this year, from nearly 10 percent in 2010. Businesses report that more frequent blackouts have forced them to lower production and spend significantly more on diesel fuel to run backup generators. The slowdown is palpable at Sowmya Industries, a small company that makes metal shutters that hold wet concrete in place while it solidifies into columns and beams, a crucial tool for the construction industry. The company, located outside this city on the southeast coast of India, is struggling with several issues, including a 20 percent increase in the price of raw materials and falling orders. But Sowmya’s manager, R. Narasimha Murthy, said the lack of reliable power was an even bigger problem. His company loses three hours of power every evening. And all day on Wednesdays and Saturdays — euphemistically called “power holidays” — it receives only enough electricity to turn on the lights but not enough to use its large metal-cutting machines. A major problem is the anemic production of coal, which provides 55 percent of India’s electricity. Coal production increased just 1 percent last year while power plant capacity jumped 11 percent. Some electricity producers have been importing coal, but that option has become more untenable recently because India’s biggest supplier, Indonesia, has doubled coal prices. For many businesses, the power shortage has become debilitating. In the southern state of Tamil Nadu, Srihari Balakrishnan, a textile factory owner, said he goes through 6,300 gallons of diesel fuel on an average day to keep his operation running, spending $3,000 more than he would if power were available around the clock. “We are not able to use 20 to 30 percent of our capacity,” he said. “We can’t use grid power for two full days of the week. When we have power, we have a six-hour cut,” he added, using an Indian term for blackouts. Other companies are also stuck. Reliance Power, controlled by the investor Anil Ambani, says it has stopped construction on a large electricity plant nearby because it can no longer afford to buy coal from Indonesia as planned. SUMMER in the plains of Pakistan is excruciating enough without the added joy of 20 hours of power cuts a day. Earlier this month protesters in several towns in Punjab, Pakistan’s wealthiest province, smashed windscreens, blocked motorways, shut down markets and set fire to the offices of parliamentarians and an electric utility. They clashed with police who brought out handcuffs and tear gas and fired live rounds in the air. It was a reaction to electricity shortages that had plunged parts of the province into darkness and scorching heat. At one point the gap between supply and demand hit 7,500 megawatts (MW), or nearly 40% of national demand. Under the current government, the power sector has neared the top of a list of security, political and foreign-policy problems that includes some heavyweight contenders. Last week’s confluence of events once again underlined how easily Pakistan’s power sector can slip into collapse. The system’s many weaknesses find it all too easy to conspire. Cool weather in the north meant a reduced flow of hydroelectricity. Demand shot up as summer temperatures further south soared into the forties and air-conditioners strained to keep pace. Meanwhile, several private power producers had to halt or slash production because the state-run power purchasing company hadn’t paid them. They had not been able, because the biggest consumers (especially provincial and federal governments) had not paid their own electricity bills. The bills that were paid are not enough to cover the cost of generation. This so-called “circular debt”, currently about $880m, is an ongoing problem. The government usually bites the bullet, as it did this time, by paying off a portion when power producers are about to sue for default, enabling them to start generating again—for the moment. What remain unaddressed are the structural issues that cause the debt to pile up again: poor recovery of dues (receivables stand at $4 billion), electricity theft, transmission losses, reliance on imported oil and politically sensitive subsidies for certain groups. Perpetuating all of this is a lack of efficiency and co-ordination across a maze of state-owned agencies including a power purchaser, distribution and generation companies, a regulator and various ministries. The gap between the effective cost of generation and payments received is estimated at $12 billion over the past four years. ISLAMABAD - The $ 1.2 billion Iran-Pakistan gas pipeline project, set to be completed next year, may prove a bonanza for the hard-pressed energy sector of Pakistan’s economy as the initiative will supply 750 million cubic feet of gas besides helping to contribute 4000 MW of electricity to the national power grid. Iran is stated to have completed 900 km of work on its side while Pakistan launched its part of work last month, thus setting the stage for an ambitious undertaking which will greatly overcome Pakistan’s severe energy shortages. In the prevailing energy crunch, the PPP-led coalition decided to go ahead with the project despite stiff opposition from some quarters. However, the Pakistani government despite the pressure has signed the agreement with Iran to meet its energy shortages. President Asif Ali Zardari and Iranian President Mahmoud Ahmadinejad signed the Inter-Governmental Framework Declaration (IGFD) of the IP project in Tehran on May 24, 2009. After signing ceremony of the Sovereign Guarantee Agreement (SGA), Pakistan’s then Minister for Petroleum and Natural Resources Naveed Qamar signed Gas Sales and Purchase Agreement (GSPA) with Iran on June 5, 2009 through which Pakistan would import one million cubic feet gas per day. The government had also appointed the engineering and project management teams in April 2012, to conduct route surveys on IP, who later submitted a final detailed report on the project. Pakistan is experiencing a prolonged power crisis, low gas pressure and suspension of Compressor Natural Gas (CNG), adding to the problems of the masses. Advisor on Petroleum and Natural Resources to the Prime Minister Dr Asim Hussain said the government wanted to complete the project as soon as possible in order to overcome the looming power and gas crises. He said the government of Pakistan had started work on the project in December 2012, while Iran had already constructed more than 900 km of the gas pipeline on their side. Asim stated that after completion of the project, it would start supplying 750 million cubic feet gas per day. He said the implementation of the project showed that Pakistan had a flexible foreign policy. In a press conference on the sidelines of the summit of the Group of Eight Developing Countries (D8) in Islamabad on November 22, Iranian President Mahmoud Ahmadinejad vowed to complete the multi-billion dollar project within the stipulated time. He said the portion of pipeline on Iranian side was about to be completed while Iran was also extending financial assistance to Pakistan to complete the project. Another purpose of signing this pact was to strengthen the bilateral relations between the two countries. Not a single penny has been allocated in federal budgets for power generation for the last 19 years despite unprecedented electricity loadshedding in the country. This was stated by former managing director of Pepco, Engineer Tahir Basharat Cheema, while addressing a seminar on “Pakistan power sector: past, present and the future” held here at Pakistan Engineering Congress on Wednesday. Stressing the need for higher budgetary allocation to meet rising power costs, he observed that no government has allocated any fund in national budget for electricity generation after 1994. “The National Highway Authority was given Rs92 billion in current budget while Rs16 billion was allocated only for a single constituency and if this amount was given to power sector that would have gone a long way in eliminate power loadshedding.” Cheema, who is presently heading an Energy Management Committee of the Ministry of Water and Power, stated that government's seriousness to control power crisis can be gauged by the fact that it allocated a minor amount of Rs15 billion for power sector but that was not released either and diverted to some other project. “In order to tackle the energy shortages, maximum funds should be allocated for construction of dams or water reservoirs, besides tapping of Thar Coal, completion of Iran-Pakistan gas pipeline, energy conservation & energy efficiency, fuel mix and energy rationing.”At least Rs50 billion of the total budget should be allocated for hydel power projects, he stressed. Reliance on costly thermal power has been jacking up the cost of production and the import bill as well. “The country is in dire need of an urgent shift in its energy-mix in favour of hydel power and local fuels. Use of biogas should be promoted throughout the rural sector both for electricity generation and gas for cooking besides producing bio fertiliser, said the power sector expert.He expressed that 175 billion tons of Thar coal reserves with a price tag of $13 trillion in the international market are enough to provide 100,000MW of electricity for 100 years. Uninterrupted and affordable power supplies can turn Pakistan into an economic powerhouse. While expressing the optimism for construction of Kalabagh Dam, he said that Sindh needs fresh water the most and it is the KBD, which would fulfill its dire need of fresh water.. I recently got a question the other day about Pakistan. It is having a serious electricity crisis. One of the solutions proposed to me was that a pipeline be built from a neighboring country, Iran, which has a lot of natural gas in order to fuel the power stations of this South Asian state. The electricity generating stations in Pakistan need to be better maintained. Many plants are simply not running due to bad maintenance. More people need to be paying their electricity bills. The pricing of electricity needs to be more rational. Without the right amount of payments coming into an electricity company, even if it is a public sector company, the company cannot remain solvent and well run for long. Pakistan’s electricity is produced by two public sector utilities and about 20 plus independent power producers. Part of the problem with this in some developing countries is that in the villages and even the large cities one can see thousands of “informal” wires being connected from the electrical poles to houses and businesses without any meters (or even safe connections, but that is another story). Income losses from essentially stolen electricity are gigantic. Pakistan’s electricity demand growth of about 10-11 percent per year is overwhelming its supply of electricity. About 55 percent of Pakistan’s people use biomass, such as cow dung, other agricultural waste, garbage and more to heat, cook, etc. These people will likely have an increasing want for electricity connections in the future. Pakistan will not develop even near to its potential if this huge proportion of its population is not connected with electricity, either on a grid or via distributed energy systems at the village and town levels. KARACHI: Trans-Asia Refinery Ltd (TRL) has made a major announcement expressing its ‘total commitment’ to building the most complex refinery in Pakistan, producing more than 100,000 barrels a day and 4.0 million tonnes of petroleum products every year. The refinery will be located at Port Qasim, Karachi. In a major boost to the country’s economy, TRL signalled the end of previous delays with an undertaking that ‘the investors have decided to push the project forward in the interests of all parties and the people of Pakistan’. TRL’s determination to see the project through to completion is demonstrated by two important initiatives announced yesterday. First is the appointment of Descon to undertake a complete ‘health check’ inspection of the TRL refining equipment. The second is a newly-completed restructuring of TRL management to ensure the project proceeds with all possible haste. TRL CEO Sultan Al Ghurair said he was delighted to have Descon on board in order to develop the project further. Descon is the leading engineering and construction company of Pakistan. The company said that, since the refinery had been delayed for some time, they will perform a health check of critical equipment before the EPC contractor is finalised. When completed, the TRL Refinery will annually produce 80,000 tonnes of LPG, 455,000 tonnes of Naphtha, 410,000 tonnes of motor gasoline, 422,000 tonnes of jet fuel, 1,000,000 tonnes of gas oil – from which 630,000 tonnes will be treated diesel – 1,050,000 tonnes of fuel oil and 200,000 tonnes of bitumen. All the products of the refinery are in high demand in Pakistan.